Weird things happen when you go from thinking of your website as self expression to thinking about it as a model of your emerging thought — that memex-like collection of things you’ve read and thought and agreed with and disagreed with. One of the things I do periodically is throw search terms at my Wikity site and see what comes back, to see if I’m thinking enough about issues I care about, or if I’m falling into just amplifying the things that pop up in my stream. Looking at that, I know some of the reasons. While I am interested in colonialism and post-colonialism and how it intersects with issues I care about I (like 99% of the population) find the rhetoric and style of post-colonialist studies to be unbearable. (Don’t worry, I won’t argue that point here). The real point is that not liking the style is not enough of a reason to not have cataloged important insights and ideas from that community. By periodically searching my cards I realize where I’m falling behind, where my learning gaps are, and I move to correct them. I can do that because this is my library of thought, not a newspaper expressing my latest opinion. I’ve been thinking a lot about our non-traditional students at Washington State University, especially since seeing Marcia Devlin’s excellent presentation on this demographic at DLRN. Broadly, what the research says is that the students who do best in college are not the brightest and the most creative, but the students that know “How to College”. You see this all the time when you start looking for it. A while back I got into a conversation about textbooks with a person who said no student in their right mind really paid full price for textbooks. When pressed on how he had saved money on textbooks in college two things came to mind. First, his parents had told him how to shop around. Second, his dorm buddies had told him how to save money by renting, etc. Last week, my daughter (a high school student taking her first college classes) was looking at her course syllabus, and had a bit of a panic. The syllabus said the final was on Wednesday, but it didn’t say the time. Had she forgotten to write it down in class? I explained, no, the way it works is that the whole university has a single finals schedule based on the normal meeting time of the class. Just look on the schedule and find when MWF 10 a.m. classes are having their final. But what if she was first generation? Would she have shown up to the final at the right time? What if textbook guy didn’t have his dorm buddies to steer him through the intricacies of college textbooks? One thing that stuck with me from Marcia’s presentation was that the people who need the help are often the people least likely to ask for it, because they are afraid asking a stupid question will mark them an outsider. So you have a set of students who know How to College, and often are quite aggressive with getting their question answered. And then you have students that really need the answers who are largely silent, and if they seek help tend to seek it from similar non-traditional student peers. I hesitate to say something so trendy, but this actually seems like a place where a chatbot could do some good. Chatbots have recently become common in many industries, providing an alternative interface to a database of information. A relatively simple program interacts with people via a chat client, trying to find answers to their questions. Recently, some classes have been experimenting with basic chatbots. I know, I hate the avatar too. The complaints that students have about chatbots is these simpler ones aren’t always that good — but that’s partially because a chatbot built for a single class can’t really benefit from scale. On the other hand, a How to College chatbot could. Questions that come in from the chatbot that are not answerable by the chatbot could be forwarded to staff who research the answers and feed them back into the student database. Additionally, the chatbot doesn’t even need to be particularly good. One of the ideas behind chatbots is that they allow people to initiate conversations that they feel awkward initiating with humans. But if the chatbot cannot find the answer, the chatbot encourages you to take it to the next level and contact a human. And now you know your question isn’t *completely* dumb, because if it was a common question, the chatbot would know it, right? This allows you to contact student services or your professor starting with the line “I asked the chatbot this, but it didn’t seem to know…”. And the chatbot will even give you the email address. I’m not saying this is a panacea for Student Success. But it’s simple, it’s scalable, and if developed as an open source program, it could be rolled out many places at once. Even where not effective, the questions asked are likely to be valuable data for campus initiatives. I’m part of our campus’s Reimagining the First Year team (an AASCU/Gates project), and will bring the idea up there next week maybe. But I’m curious, have others seen talk about chatbots to support first-year students, or maybe even seen decent implementations of this idea? Is this something that’s already been going on that I’ve missed (it probably is, I’m an OER and collaboration expert, not a student services guy). Let me know in the comments. Yesterday, Roger Schank (famous cognitive scientist and learning theorist) released some of the work he and his team did for Trump University back in 2005 or so. You didn’t know that Roger Schank was involved in Trump University? Well, he was. Trump University’s online materials were designed by the artificial intelligence pioneer and learning theorist who founded one of the first online learning labs in the early 1990s (Northwestern’s ILS) and had spent (by the time of Trump U.) almost two decades researching what works in technology-mediated education. Quick disclosures: I worked for Roger Schank’s company Cognitive Arts 15 years ago (but not for Trump University), and I despise Donald Trump and everything he stands for. More on these points at the bottom of this post. So here’s what I want to tell you about the online portion of Trump University: It probably puts your university’s online courses to shame. It certainly makes a mockery of what Silicon Valley darlings Coursera and Udacity call courses. Here’s a link to some of the online materials. I think I built enough of these courses at Cognitive Arts to walk you through the design of this one. This particular course is similar, if somewhat less ambitious, than what we used to produce there. Schankian learning experiences are often structured as simulations. On a high end project (e.g. a million dollars or so) these simulations might involve branching video narratives that allow a user to play out very realistic scenarios that develop the emotional involvement that promotes deep learning. You get to know a cast of characters through video intereactions, watch situations blow up as you make wrong decisions, and become deeply invested in a multimedia storyline. Smaller projects involved different types of simulation, but one of the favorite lower-end models was email simulation. (If I remember correctly, this method was partially developed from techniques Schank’s colleague Chris Reisbeck used in his computer classes). 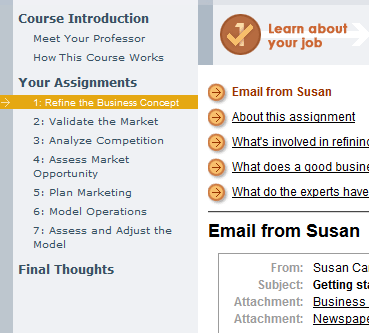 In an email simulation, you place the student in a role, usually that of a newer worker, who is asked to create or fix some artifact for a job. You learn about these projects via a set of carefully sequenced emails and assignments. In a programming class, early emails may ask you to take a quick peek at a piece of code and figure out why it’s hanging when it runs. Later emails have you reviewing specifications documents, client emails, and peer submissions and building new code. Scenario operations – the activities the student will perform to achieve mission, presented in optimal sequence. I don’t know enough about these subjects to evaluate the learning goals chosen, but the learning goals are exceptionally clear here. Schank’s focus on what it is you want the student to be able to do works well with this material. Within each module, the approaches are mixed. Having worked on these sorts of things before, I can tell you the information in each module is based on the critical skills experts need to master and the common misconceptions novices tend to have about the subject. That is, the design team for these things will spend literally hundreds of hours talking to experts talking about how things are done and why things fail, and design the tasks and feedback on what they discover. If we look at the last module (“Design a Winning Business”) we can see that the scenario operations are structured in the natural sequence you would go about the activity, with a focus on what is done at each point (e.g. 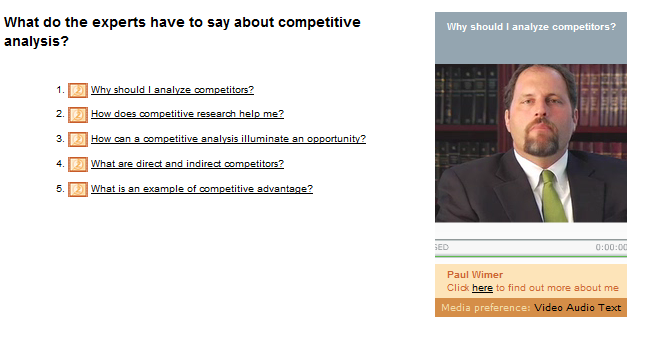 not “Introduction to Competitive Analysis” but “Analyze the Competition”). 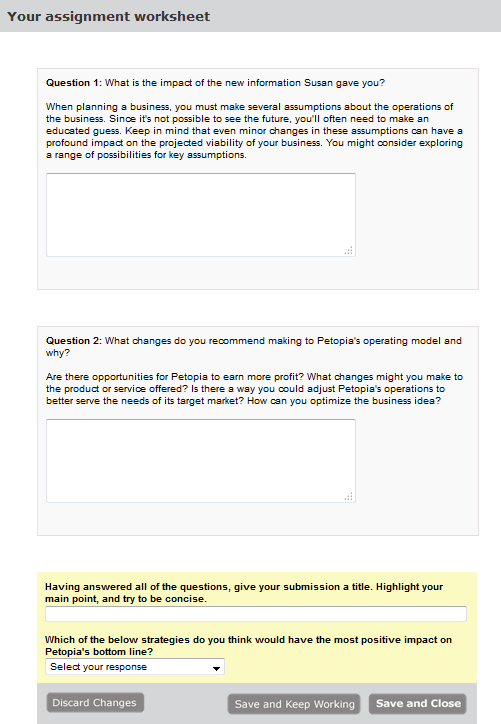 Each of these scenario operations (Refine the Business Concept, Validate the Market, etc) takes place in an email simulation. 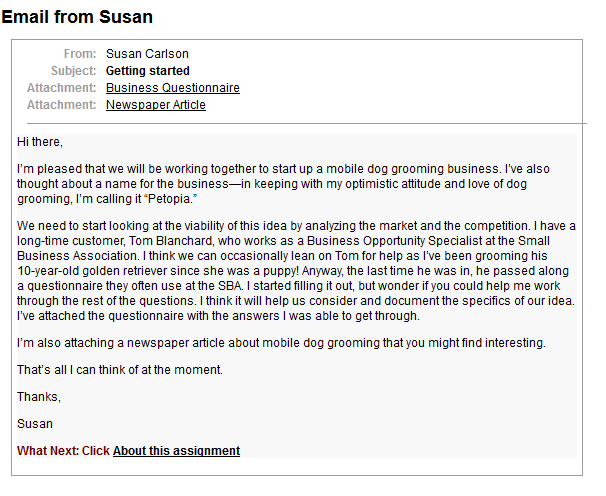 In this module you have been invited to partner with someone who thinks they have a great idea for a business — a new trend in pet care called “mobile grooming” where the groomer travels to the dog for an in-house appointment. This is a bit of a capstone mission, where you’ll use skills and knowledge you’ve learned in previous modules in a novel context. You can see the resources attached. These are meant to be realistic resources from which the student has to gather relevant information. 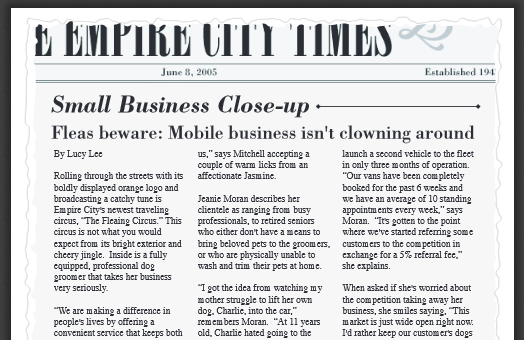 For instance, there’s an article on the mobile dog grooming trend. 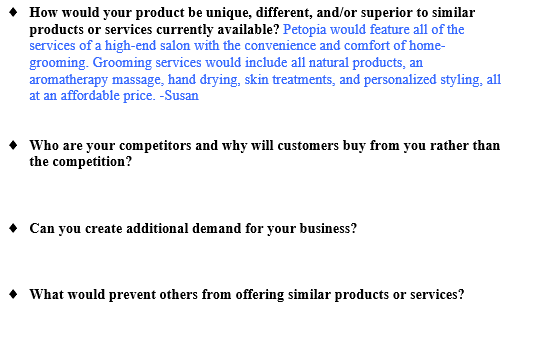 Buried in the articles are hints on the consumer profile, level of demand, and competition. Those seemingly simple questions lead to complex activities like competitive analysis, and understanding barriers to entry, etc. You’re asked to make sense of a variety of resources to determine whether the business as imagined is truly viable (and if it’s not, how can it be altered to be more successful). Here’s a cluster diagram of some of your survey results. What does this tell you about your current plan? Have you selected the correct target market? As you move through these activities (usually done through free form entry in a comments box), just-in-time support is available to help you understand the methods and meaning of what you are doing. Crucially, the learning is structured so that you are presented the information after the scenarios have led you to the question — information is presented only after it has value to your task. After your work on a segment of the scenario, you get feedback from the experts as well. What did that cluster diagram show you about your ideal target market? How did the competitive analysis flesh out which of those markets were already being served? Following best pedagogical practice, you don’t see what the experts think until you submit your own analysis, and following best practice with feedback, you see their feedback immediately after you submit, in video format. (Although other ADA compliant formats are available). 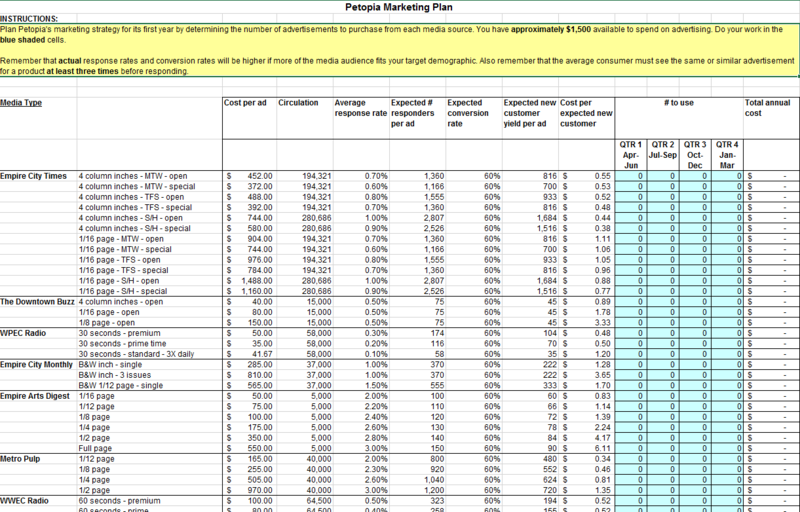 To help fill out that spreadsheet, you are given a bunch of email attachments about the demographics of each potential media buy. These are structured to look like the actual media kits you would get from radio stations and newspapers, and the information you need isn’t always directly there — you sometimes have to derive it. It’s a good example of using authentic resources that don’t map easily to inputs, to test whether students have a deep or shallow understanding of a domain. 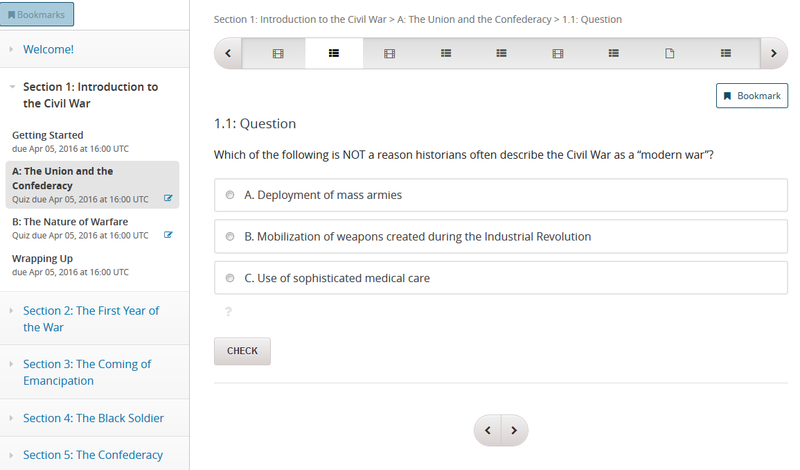 As you progress through the each scenario operation, you submit your work to your peers in the class to evaluate. You are frequently submitting an artifact (spreadsheet, etc), but after submission you are asked to reflect on your decisions and defend them. Your submission goes to peers for eventual grading, but in the meantime you receive instant feedback from experts who tell you how they would have done the activity. You apply that expert information to evaluate the work of your peers, and in turn you look at the feedback your peers have given you. The modules are often structured around complicating actions. A simple analysis is done and submitted, but new information comes to light: costs are higher than expected, new competitors have emerged, etc. Your analyses grow in the complexity they accommodate. 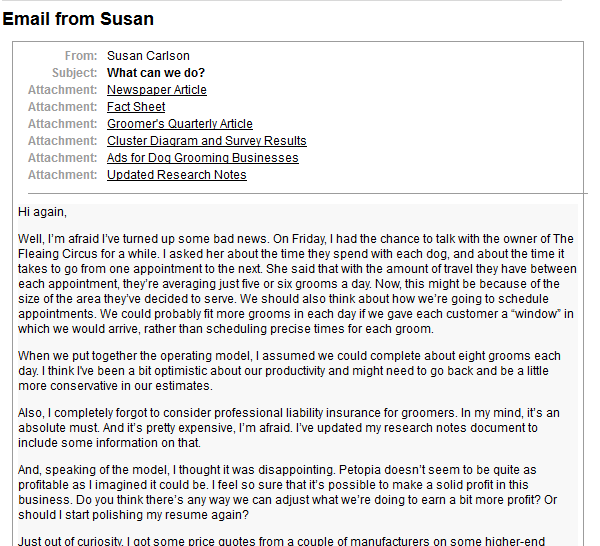 Here Susan sends you an email noting that she has realized that because of the time that travel to homes takes, there is an upper limit on customers that can be served in a day (oops!). Is there any way to salvage the plan? Given the market, can they maybe shrink the geographic area served? Make money on accessories? 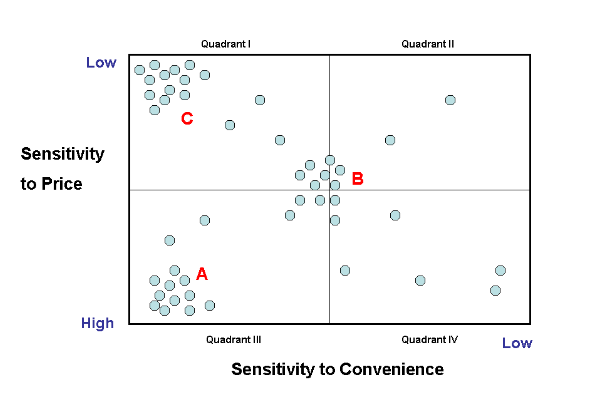 Does using a “window” instead of an appointment time affect the convenience and price quadrant we’re serving? I pose these questions here, but of course the important thing about way the exercises are structured is that you have to develop those questions yourself. In other words, Susan suggests that you adjust area served to reduce travel time, and you have to think through the aspects of your model that affects. Susan mentions the introduction of the “window” approach to appointments, and it’s up to you to translate that in your head into a price and convenience quadrant question. By the end of the module you are creating an operating model including start-up, fixed, and variable expenses using excel spreadsheets, choosing specific products based on profit margins and customer sensitivity to quality. You’re mapping out expansion plans — does it make sense to expand to cats? To open in another city? 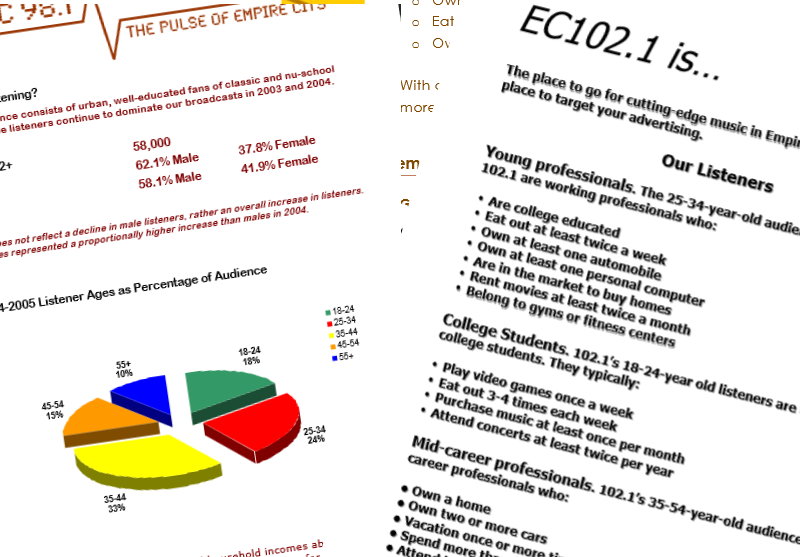 Each segment involves the creation of authentic artifacts: spreadsheets, marketing plans, competitive analyses. Often stages are sequenced and scaffolded, with Susan’s friend from the SBA helping you fill out things partially in the beginning, but as you progress you start doing the work without any substantial scaffolding. I’ve covered only a fraction of the course here, a couple segments of a couple pieces of one mission in a course. And in certain places I’ve had to intuit what goes on: the version Schank has made available is an HTML only version and does not support the server sessions needed to progress past artifact submission. But given the stuff I’ve worked on in the past I’m pretty confident about my assumptions. Depending on what you teach, you may not like the model here. It’s not a great model for a course in Issues in French Colonialism or other less applied material. But for something like this, where someone wants to learn to do something specific in an area where there is consensus on what constitutes good practice, the method is a perfect fit. And apart from being an example of Schank’s approach to education (simulations, war stories, just-in-time expertise, etc.) it’s well designed from a more traditional standpoint as well. It’s well scaffolded, expertly sequenced, and focused on application of knowledge in authentic contexts. It uses peer evaluation guided by expert feedback. It makes clear to the student what is being taught, and why it is important beyond the classroom. For various reasons, these strictly sequenced classes are not the sort of classes I’m working with anymore, and this is not my particular style of design for what I currently do. I’m an open pedagogy guy, looking for ways for students to do real work, not simulations. But different classes and objectives require different approaches and for what this class is attempting to do, this is a perfect approach. It is difficult to see the design of the Trump University online experience as anything but exemplary. In fact, if you encountered something this well designed and thought out in traditional online classes you would be stunned. More than that, consider that Coursera and Udacity built million-dollar businesses years after these courses came out. And their materials were not (and still are not) even close to this in terms of quality and research-informed design. Not even a fraction as well designed. More recently, ASU’s Habitable Worlds course is (rightly) getting a lot praise for its structure, which involves a task focus with just-in-time instruction and authentic resources. But here we have that approach in a well-developed example ten years ago, at Trump University. Columbia and Cognitive Arts plan to build a program which will focus on courses traditionally offered by Columbia Continuing Education, including courses for Columbia’s Computer Technology and Applications (CTA) Program and American Language Program (English as a second language). Columbia will also work with Cognitive Arts to develop courses in more traditional academic disciplines, such as basic economics and psychology. The courses will be Columbia courses, powered by Cognitive Arts proprietary learning technology that uses problem-based learning in the context of real life situations. Cognitive Arts’ approach is based on the theoretical work and design strategies of its founder, chairman and chief technology officer, Roger Schank. This was in 2000. So it’s been amusing to watch the Udacity, Coursera, ASU hype about scientifically designed, scalable classes when sixteen years ago I was working for a pioneer of cognitive science, building classes based on a decade of research that were designed to scale to millions.. That’s the year 2000, when a eighteen year-old Britney Spears was topping the charts, MTV was still playing music videos, and an unknown show named Survivor was debuting on network television. Watch a video. Answer recall questions. Watch another video. Answer recall questions. How did we get here? I suppose I’ll leave that to another post, but the short answer is designing quality scalable online courses takes a lot of money, a lot of custom programming, a lot of design expertise, and no one wants to pay. Except, apparently, Donald Trump. Go ahead, you can weep now. I worked for Schank’s company Cognitive Arts from 2000-2003. I went there explicitly because I was, at the time, a true-believer in his approach to online pedagogy, which seemed miles ahead of what anyone else was doing. My position at Cognitive Arts ended a few years after the first education dot-com crash when NIIT, an Indian company, acquired us in a nasty-ish leveraged buyout. I could have maybe signed on at that point to the new entity, but I was exhausted with that life at that point; years of life in a crashing startup had temporarily broken me. I took a detour out of education for a bit and built search interfaces for newspaper archives for a bit. Other people in my unit went with Schank to Socratic Arts and worked on Trump University as a project. Apart from the occassional Facebook comment, I haven’t really kept up with them. I got back into educational tech in 2005, with a renewed focus on two earlier interests of mine: open pedagogy and how participants in online communities learn from one another. In general, I’m still proud of the work we did at CogArts, my passions are just elsewhere now. I despise Trump, and think he endangers our republic with his brand of xenophobic authoritarianism. So let me say this: nothing I’ve said here defends the seminars that were staged by Trump, or the course when it switched over to a real estate focus. Nothing here defends the use of the name “University”, the price charged of people, or promises that may have been made. So frankly, you can believe that the online materials were surprisingly good, but that the University as a whole was a scam. I’d kind of prefer that actually, because I think Trump is a very scary person, and people should say whatever it is they have to to keep him out of the White House. Courtesy of Floyd’s coffee shop in downtown Portland, which hasn’t kicked me out yet, we bring you the latest Wikity Weekend Code update. But what if you want to link to a remote page? The Wikity way to do that has been to go out, find the page, fork it, and then link to it from the other page. That’s a drag! So we’ve added a new feature to the syntax. If you put a remote site in the double brackets, and that site returns valid Wikity JSON, the server will go out, copy the remote Wikity page for you, pull the title off of the JSON, and replace the link in your page with the title. Now if you think this through, you realize we’ve also made mass-forking easier. I can now put together a playlist of multiple URLs from all sorts of different sites, submit it, and Wikity will go to work grabbing the copies it needs. Ari Bader-Natal suggests an excellent idea for bootstrapping a Wikity library. What if you could import the bookmarks you’ve been saving for years in Pinboard, Pocket, or Google Bookmarks? @aribadernatal: What about bootstrapping from a set of “cards” generated from your own pre-existing online collections? This is actually pretty genius. Initially I worried that it would get people to engage in bookmarking behavior in Wikity, which is what we are trying to avoid. Wikity, unlike bookmarking, is meant to gain its power from the novel and repeated recombination and maintenance of cards rather than acting as a memory aid. It can look like bookmarking, but it’s much different. But then Ari pointed out that the bookmarks could be imported with a tag that reflected that they had not been done up yet as true Wikity cards. Users could search for information, find the cards, and iteratively improve them as they go. This is a brilliant way of bridging old technology and new. But it brings up a question: What does it mean to convert a bookmark to Wikity style? So let’s show you that. So I have this bookmark from last year in Pinboard on Yoko Ono. It’s to this article, which is primarily about why seeing Ono as the “person who broke up the Beatles” does a real disservice to her creative vision in the areas where she had excelled. Along the way it explores the misogyny of the Yoko legend, and celebrates some of her artistic achievements, many of which see prescient now. It’s a complex argument and subtle presentation, and it’s written in a form — essay — which supports that. But it’s also a form that resists recombination and reuse. All these facts and ideas and theories and examples in the article are welded together to make a point, and at the end they succeed: Yoko suffered an erasure, based on racist misogyny, despite the brilliance of her work. Now, you can bookmark that, and if anyone ever says to you — “Yoko broke up the Beatles” or mentions that she was unfairly vilified, or that she was actually a creative genius — just not a genius in the form her husband made his living in — you can say, actually I have an article about that for you to read! Bookmarking is awesome. Don’t get me wrong. But when we are bookmarking big elements like this we are not tapping into the power of hypertext. So how do we remake it into hypertext? We look for the smaller, re-combinable pieces in the text and write them up. Let’s start with the first thing of interest in the article: this “Film Script 5” that she wrote. The name of the card is not the document name in most cases, it’s a name for the example, idea, or bit of data in the card. It’s also not necessarily a description of the card. It’s a name, like a variable name in coding. It might be descriptive, but it should also be short and memorable and above all unique. What I’ve found in practice is to make it unique and memorable you have to bend on the desciptiveness, and sometimes get a bit cute. Let’s name the card “Look at Doris Day”, a slight but justifiable abbreviation. This is the name for our idea/example. I often write a bit of the treatment (the body of the card) before I write the abstract (the introductory paragraph). This allows me to play with the idea a bit before locking down its significance. 1) not to look at Rock Hudson but only Doris Day. watch it until it becomes square and angled. This is a bit of Dada, a bit of Fluxus. It’s a play too on fundamentalist religion and other forms of belief (you can’t actually make round objects square and angled, for example). And of course the title “Film Script” is hilariously funny: this is a script not of a film, but a script to follow while watching a film. This might also be an activity that could be useful in a film studies class. Can students watch a film and write a “film script” for it that helps a watcher see a deeper meaning? Or the impossibility of watching it in a certain way? Not entirely her intent, of course, but a possible application. Now we write the summary. This is important, because it’s the piece that will be visible in search results. What’s the main thing that interests us about this piece of art? The “film scripts” of Yoko Ono’s 1964 work “Grapefruit” are in fact meta-scripts, ways to watch films not intended by their makers. They allow the viewer of a film to transgress the expectations of viewership, and a way to “defamiliarize” existing art. In doing so, they invite the viewer into the artistic process. I throw in a string of dashes (to indicate that we are in the references section) and throw in a link. For readability, we try to put the link at the end of the linking sentence. There’s also something here about audience participation I’d love to capture in a link. on that. I search “audience” and see the “Horse_ebooks” card. A couple things to note here. We put external links at the end of paragraphs to keep Markdown readable. I used to just put “link” as the link word, but have been playing with other options. The sentence preceding the link should summarize the relevance of the article to the card. On the tags, I suppose the question you’ll ask is what’s up with putting tags in the text. Well, there are reasons. The biggest reason is that it’s just easier to add items this way than grabbing the mouse and clicking into a tagging interface, and eventually we can make it so that the tags sync up with the WordPress tag structure on save. This way we can preserve metadata even when our systems might disagree on what counts as usable metadata. Anyway, that’s how you do it. Your card is now ready to be recombined with others in interesting and generative ways. It actually takes much longer to explain than to do. Ari has pointed me to some IFTTT scripts that might help make this a reality, so I’ll be looking at those when I get a chance. But seriously, consider freeing your bookmarks — they can be so much more if you let them. These cards, when opened up, present a full page of content. They are structured for maximum reusability: an abstract of the content up top, a treatment of the idea, example, or data in the middle, and a set of references and cross-references at the end. This structure allows one card to serve many purposes. The References Section links ideas together. This notes a relation between the problems outlined in Slack and Case’s analogy of the lowly tea kettle as “calm” information technology. These cards can be written by you, but, more importantly, they can be copied from other people’s libraries. If you find a card that is interesting or useful you “fork” it in, and are able to edit it to your heart’s content, adding more data to it, cleaning up the synopsis, or, in most cases, coming up with new connections. What I’ve been struggling with a long time is why the process of adding and maintaining this library of cards is so obviously useful to me, and so opaque to others. The video below is long, and you don’t have to watch it all to understand the point I’m about to make. But if you skip through it you’ll see a straight up recording of my morning process with Wikity that I went back and narrated it (and sped up a bit too). And you’ll see the process of reading becomes totally different with it. I find one article, but as I summarize it I’m connecting it to other ideas in the library, I’m finding gaps in the library and making up new cards, I’m reorganizing, tagging, and and expanding other ideas. This starts out as one summary of one article, but it ripples through the entire library. It gets you thinking about the article in a deep way that goes far beyond our usual knee-jerk reactions. By the end of the session we’ve drawn a relationship between this Facebook implosion in the article and the work of Clay Shirky, the death of the 1970s Communitree BBS, and the phenomenon known as the Fair Process Effect. We’ve dug into issues of League of Legends trolling and the psychology of shame. Not bad for twenty minutes of writing and reading. The Memex did not ship empty. The owner of the memex, let us say, is interested in the origin and properties of the bow and arrow. Specifically he is studying why the short Turkish bow was apparently superior to the English long bow in the skirmishes of the Crusades. He has dozens of possibly pertinent books and articles in his memex. First he runs through an encyclopedia, finds an interesting but sketchy article, leaves it projected. Next, in a history, he finds another pertinent item, and ties the two together. Now, I know all of this. But my assumption had been that the common record that people in Wikity would use would be the work available to them in the community (via the federation mechanism). They could fork what they needed into their site as they needed it. But why begin that way? If the point is for the user to build a library of useful items, why not give them a head start? You select the starter library “Physics”, but what you get is not a traditional textbooks, but a web of content that you can use as starter material to build out your own knowledge web. We can even imagine there are two licensing options — you get the starter content free if you agree to share your own revisions and additions back to the community, or you pay five bucks to use it behind a firewall. Then, when you read an article or piece of research on physics for your class, you build out your web and link your summary of the article on gravitational waves to a piece on whether astronomy is really a science if it cannot do experiments. If it’s a good and helpful link, people fork it, and if a lot of people fork it, a publisher takes note and includes it in the next version of the starter library. How do we bootstrap something like this when there are no starter libraries? I’m not quite sure. I tried taking apart an open textbook a whole back and breaking it up into pages, and it felt like it didn’t quite make sense in wiki — it wasn’t built for the sort of dense linking and reuse that a wiki page is. But maybe with some work we could get there. Ultimately the idea of the starter library is not that unique — copying entire repositories as a first step is standard in things like git, for example. But I think that combined with our more granular forking and editing architecture in Wikity that it presents a unique opportunity to redefine what a textbook or other reference work might be.